What will be the name of the Ferrari F1 car for 2014? It will be chosen this coming January by millions of Ferrari fans from around the globe through the Internet. President Luca di Montezemolo announced the news at the traditional pre-Christmas dinner with the Italian motor sport media at the Fiorano circuit. Ferrari has always made good use of its website, and indeed the Scuderia was the first F1 team to present its new car on line, back in 1996. Once again this year, the new car launch proved very popular, with 83,000 all on-line at the same time, a figure almost equal to those who watched the wedding of William and Kate live (87,000) from 158 different countries. 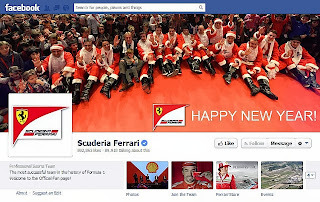 The Scuderia’s website has comfortably exceeded 10 million pages visited (+13.5% compared to 2012) and had 3.5 million individual visitors (+28%) while hits have grown by 20% from 4.5 to 5.5 million. Visitors have come from 227 countries: Italy still leads the way, followed by Great Britain, Spain, USA and Brazil, but there are also plenty of fans in the Central African Republic and Tonga.